Originally released in 1966. Fahey's never recorded an album that was more thoroughly of its moment. From the groovy flute and twangy sitar accompaniment to the backwards guitar, this Birthday Party is a charmingly trippy 60s time capsule. But it isn't a two dimensional one. The album gains immense depth from the tension between his sweeping, fingerpicked melodies and discordant string-battery. It's the audible battle between yearned for rose colored luminescence and ankle blistering hellhound darkness that enables this record to transcend its hippie dreaminess. On orange vinyl. 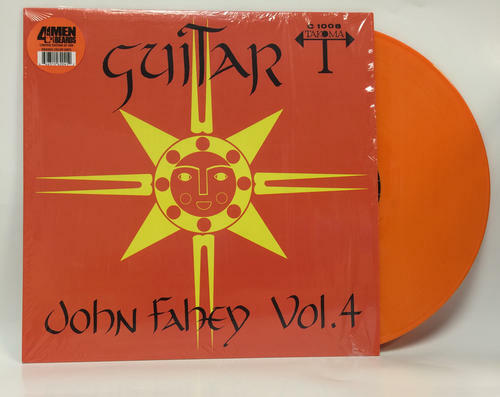 The John Fahey vinyl box set "The Transcendental Waterfall" FMN600 UPC:646315160017 is also available!